The 5th ‘Wartime in the Cotswolds’ event on the Gloucestershire and Warwickshire Steam Railway (GWSR) was a roaring success with large crowds over the weekend, particularly Sunday. The event had lots of re-enactors dressed up in period costume with lots of soldiers, sailors and airmen as well as ladies and gents in wartime garb. This included the singers/groups at Cheltenham Racecourse, Gotherington and Winchcombe station platforms. At Toddington station they were stalls with lots of period costumes for sale and wartime vehicles, both military (2nd battalion Royal Warwick regiment) and civilian. Also, the miniature railway was running as well as a swing band. 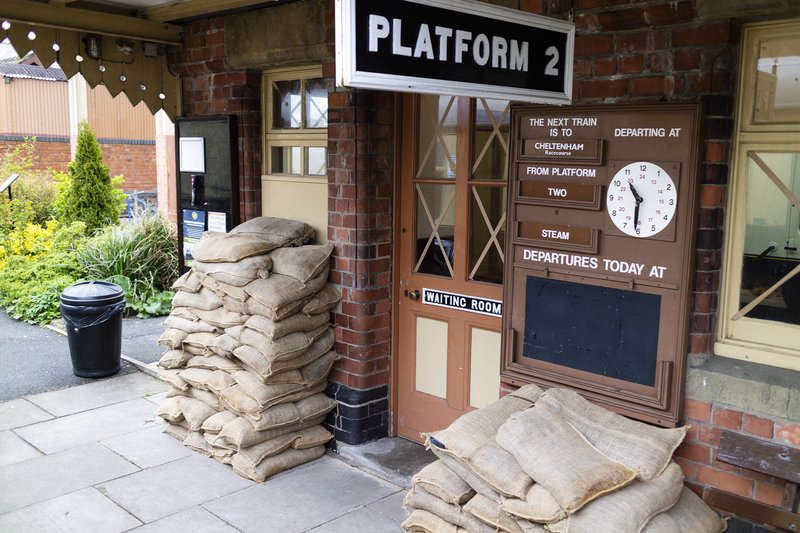 All the stations were dressed for wartime with sandbags and military soldiers standing guard, as well as lots of people in the wartime costumes, including paper boys. 7820 Dinmore Manor a 4-6-0 engine also from Great Western Railway and 35006 ‘Peninsular & Oriental S.N. Co’ a Merchant Navy class locomotive which ran on the Southern region (and owned by The 35006 Locomotive Company Limited). Also, for the shuttle service between the newly opened Broadway station and Toddington station a Diesel Multiple Unit (DMU) class 117 (owned by Cotswold Diesel Railcar Ltd) was running for the spectacular ride over the Stanway Viaduct on onto Broadway. At Winchcombe station you could view away from the steam trains (which passed each other on the platforms) the Army Field Hospital, RAF Operations Room, Talks and demonstrations in the Tim Mitchell building, the Discovery coach and model railway as well as Army units from Gloucester and Dorset regiments. You need also not to miss a visit to the Top Hat Club with its local beers, as well as the burgers and drinks and snacks from the café. Entertainment was from 1940s singer Betsy Harmony and a Laurel and Hardy act. Gotherington station (which is privately owned) had a Bomb Girl theme with two singers Etienne and Violette Szabo entertaining the passing trains when they stopped at the station. In the owners garden a Pump trolley, children’s activities and lots of railway memorabilia was on display as well as military tents and policemen, again thanks to the owner. Broadway station had a marquee on the village green with a jazz band, as well as visits from “King George VI” and “Winston Churchill” as well as a best dressed shop and vintage bus between village and Broadway station. The views from the steam trains during the journey between Toddington and Cheltenham Racecourse were spectacular including the journey through Greet Tunnel (693 yards long) and in through Gotherington to the end of the line currently at Cheltenham Racecourse. 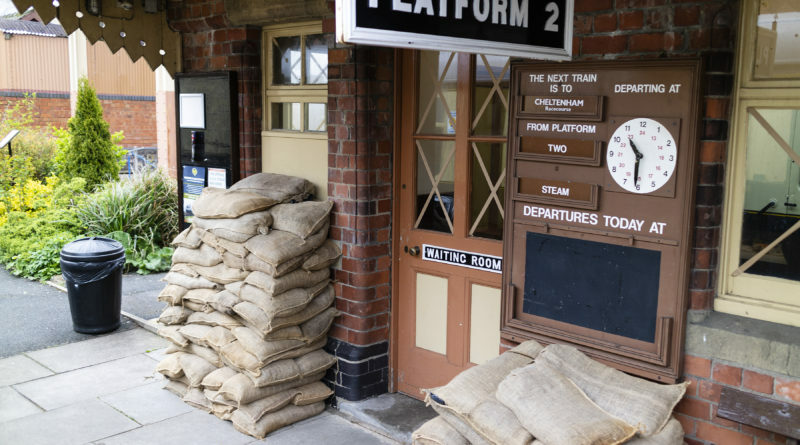 The event was a success again and let’s see if for 2019 if the steam trains can do the whole route between Broadway and Cheltenham Racecourse, once the finishing touches are completed at Broadway station, including bridge and café. During the rest of the year there is the Spring Steam and real Ale weekend, Cotswold Festival of Steam Gala, Back to Broadway Heritage Diesel Gala and Santa Christmas Specials. The 2019 Wartime in the Cotswolds event is on April 27th and 28th 2019. For my full set of images please view my Flickr Album.